I love reading digital photography books and magazines. After many years of experimenting with my camera and managing to take a few great pictures, I find that I am still learning. The more knowledge about photography I acquire, the better my pictures become. That's the beauty of photography. No matter how good you are, there is always some area, skill or technique that you can learn more about that helps you improve your photography a little bit more. That's what I love about these photography ebooks I have reviewed. If I purchase a digital photography book for $20 and find at least two or three 'golden nuggets' of information that I didn't already know, then I think that's money well invested. Every digital photography ebook that is listed below, I have read. I have either bought my own copy or been given a copy by the author to review for this website. These photography ebooks are downloadable immediately after purchase and usually come in a .pdf format. The reviews are based on my honest opinion of the ebook. If the ebook is not worth the money or not well written, you can be guaranteed that I will tell you about it. My reviews are not biased in any way in order to sell these photography ebooks, although if you think that an ebook would be of interest to you, there are links to the ebook sales pages for you to purchase your own copy. If I make sales commission from any of the digital photography ebooks that I review, I will put a * at the end of the link to let you know. 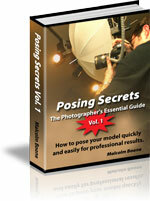 Posing Secrets is an essential guide for photographers that shows you how to pose your models easily and quickly for professional results. This eBook contains uses simple step-by-step instructions and innovative illustrations to show you how to improve your portraiture. Click here to read my full review. 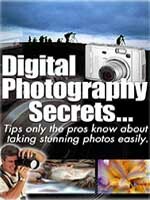 Digital photography secrets promises to let you in on the tips that only the pros know about taking stunning photos easily. This eBook contains over 125 full color pictures explaining the techniques and secrets as well as 21+ basic strategies for producing better photos. Read my review of the eBook to learn more.